Origen is a San Diego-area based artisan roaster who sells coffee both online and at the North San Diego Farmer’s Market. These beans were roasted on 10/15 and I received them from Erin on 10/16 – talk about fresh! I wasn’t able to brew either bag immediately, but I did open both to take a peek. I noticed that both the Mexican and Tanzanian beans I got were roasted to what I would consider somewhere between Full City+ and Vienna roast; the beans had a slight sheen of oil on them. Oil on coffee beans: good or bad? It’s good if you like darker roasts (and oil does start appearing on the beans the longer they are roasted), but I find that having visible oil on the surface of the beans seems to shorten their shelf life before the beans start smelling rancid. Best to drink this sort of coffee rather quickly. I also imagine that using this sort of bean regularly will require more frequent cleaning of your coffee grinder. Generally speaking, most of the light roasts you can buy from artisan roasters won’t be shiny; they’ll look dry, actually, as the trend is to roast at lighter levels before the oil inherent in the coffee beans starts coming to the surface. However, if you are a medium-dark to dark roast fan, your beans will likely be shiny, which will be a good visual cue for you about whether the beans will be to your taste. You know what’s great about coffee? You can find a roast level to suit your personal taste. It’s true that Starbucks and other second-wave shops roast on the darker side, and third-wave shops typically carry beans which are roasted on the lighter side, but I also think that roasters these days are trying to roast coffee to maximize the flavor potential of the individual beans, as opposed to just roasting “light”. Mexican coffee and coffees similar to it seem to benefit from a darker roast than Ethiopian coffees, for example. Whole beans: These beans immediately reminded me of Peet’s Coffee in their color, size, and the sheen of oil coating the beans. V60: Tastes dark to me. I couldn’t really pick up on any flavor notes other than “coffee” but it was pleasantly smooth – not bitter or burnt tasting. AeroPress: Toasty and deeply flavored. Tastes like coffee. Great as a concentrate – I think this would be terrific with some milk and sugar added. 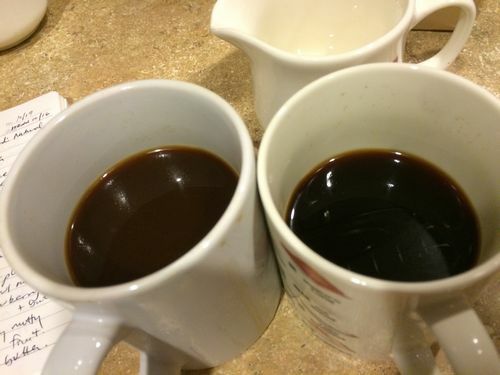 For comparison’s sake, here’s a cup (on the right) side by side with the OCCR Geisha I reviewed recently (on the left), which is quite a light roast. Stunning color difference! Chemex: In both the V60 and Chemex brews, I noticed that even adjusting my usual grind settings to the fine end of normal was not enough, as the coffee extracted a bit faster than I would have liked. These beans are darker than I typically drink, and beans get less dense the longer they are roasted so I will need to adjust my grinder accordingly. This tasted about the same as the other cups. French press: I had expected based on past experience with Mexican coffees that the french press version would be my favorite, but honestly, I really couldn’t taste a difference between the four cups other than in body (the filtered methods were a little thinner than the press pot). All of the cups had the same flavor notes. Very consistent coffee that tastes similar no matter the brew method. Cold brew: I had a hunch when experimenting with this coffee that it would make an excellent cold brew. Boy, was I right!! After letting the grounds steep for a full day (okay, 23 hours… I cheated a tiny bit), I ended up with 16 ounces of some of the most rich, chocolaty, nutty, delicious cold brew I’ve ever had. This brew method really showed off the chocolate notes of these beans to great effect. Shutterbug nodded vigorously when I described it as a brownie in a cup (he couldn’t talk because he was drinking the cold brew at the time). Summary: If you enjoy the coffee from places like Peet’s but are interested in supporting a small business, give this offering from Origen a try! It’s especially nice as a cold brew, and is also a crowd-pleaser brewed hot. This would be an particularly nice coffee for those that take milk and sugar in their coffee. From the roaster: In the cup expect rustic chocolate and molasses with hints of cinnamon and clove.